Drip drop, drip drop. It's April, and yes, it's wet. When trying out binoculars, it can be a good idea to do so on a less than perfect day, as that's when you really start to notice the differences between binoculars. For reference, I have an Endurance ED 8x42 with me, alongside the 8x42 and 10x42 Frontier ED X. 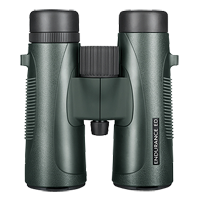 The Endurance ED 8x42 is an award winning binocular and one I'm a big fan of, but at nearer £200 it will be interesting to see how it compares against its more expensive sibling. The simple answer, as expected, is the new Frontier ED X is superior. With dielectric mirror coatings, more light reaches your eyes and the difference is immediately noticeable. On this grey day, that little bit of extra light helps reveal more detail and colour on a visiting magpie, its iridescent feathers looking superb. The same goes for a pair of starlings which are nesting in the box just outside the front of the shop. After taking some grubs to their recently hatched chicks, one briefly popped on to the suet feeder to keep its own energy levels up, allowing me enough time to compare the two again and notice the Frontier ED X just has a bit more punch than the Endurance ED. Putting the Endurance aside for now, I sit and watch the birds on the feeders for a while, flicking between the 8x and 10x. With an 8.1° field of view, I can see 3 feeders at once through the 8x42, whereas the view is a bit narrower on the 10x42 at 6.4°, but of course I am closer to the action. With a steady hand, I'm more than comfortable using the 10x magnification, but for general garden birding, the 8x get me close enough and allow a fraction more light in too. Phase corrected prisms are to be expected nowadays in anything £200 or more, increasing the overall clarity of the image, but the retention of detail up to the edge was a nice surprise. The Frontier ED X don't feature field flattening lenses (and aren't expected in this price range), so some softness and field curvature can be seen, but I was still more than pleased with the performance. The extra-low dispersion (ED) glass does its job splendidly, reducing levels of colour fringing to barely noticeable. Close focus is quoted by Hawke at 2m for the 8x42 and 2.5m for the 10x42, in my tests I couldn't get quite as close but only out by about 10cm for each model. Constructed from magnesium alloy, the body is almost completely covered in a grippy rubber armour, including the lanyard loops on the barrels, with just a few bits of metal left exposed. This gives the Frontier ED X a stylish appearance, whilst also acting as a reminder of the quality materials used. The dioptre and focus wheel are both a cross between exposed metal and textured black rubber, providing good grip. The dioptre turns smoothly with adequate resistance but isn't lockable, while the focus wheel takes 1.5 effortless turns from close focus to infinity. Another hint towards excellent build quality can be found in the twist up eye cups, which not only hold firm in each of the 3 stops, but can be twisted all the way off like those found on top-end Swarovski and Zeiss binoculars. What this allows for is easier and more thorough cleaning, as well as a simpler solution for replacing damaged eye cups after years of wear and tear. The objective lenses are protected with a water repellent coating and of course, the binoculars are nitrogen gas filled and completely waterproof. 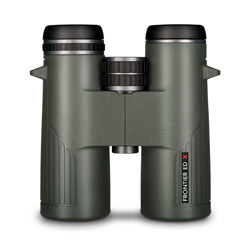 At around 700g, they're not a heavy binocular, but not as light as some others (including the Endurance ED 8x42). Eye relief is 18mm and 15mm for the 8x42 and 10x42 respectively, which should provide spectacle wearers with a full field of view. Without glasses, I found I had a perfect picture with the eye cups twisted all the way up. The classic single hinge design is tried and trusted for comfort; I certainly felt happy using the Frontier ED X for long periods. You won't find any thumb indents on the under side of the barrels, like those on the old Frontier ED and the Endurance ED, but I personally believe those recesses don't offer any extra comfort/grip anyway. Following on from a hugely successful Frontier ED family, the new Frontier ED X had a lot to live up to and it thrived in almost every area. 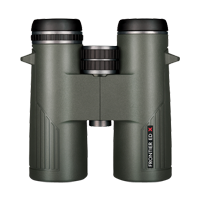 The optical and build quality is a grade above the Endurance ED binoculars, but so is the price tag. 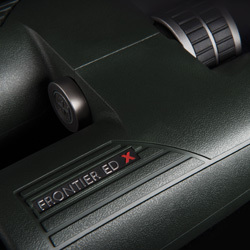 I still highly recommend the less expensive Endurance models, but for those looking for a more serious prospect, one which offers the keen naturalist a brighter, more vibrant image, then the Frontier ED X is well worth a second look. *August 18 - What was a 10 year guarantee is now a "No-Fault Lifetime Warranty" - a fantastic service provided by Hawke.